OUR PATH. In Our Path the nine points of our political program are elaborated upon to form a complete political platform with clear analyses and realistic solutions. The publication deals with mass immigration and race, geopolitics, zionism, economic policy, form of government, freedom of speech and media, nature and the treatment of animals, environmental policy, national socialism, national defense, crime and punishment and much, much more. 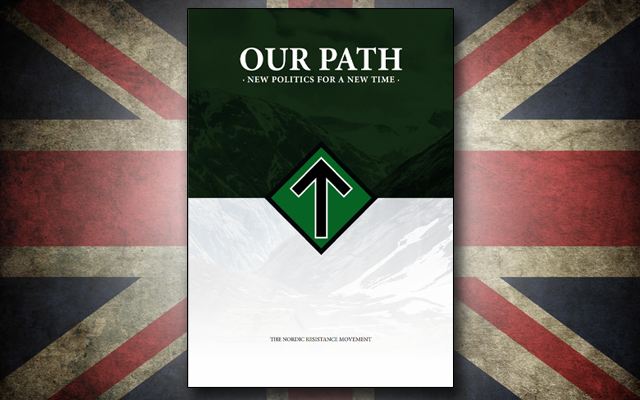 Our Path is the party platform of the Nordic Resistance Movement. The Nordic Resistance Movement is a National Socialist organization operating throughout the Nordic countries. We are active both within the political system as well as outside the parliamentary order in our efforts to come to power and advance our political ambitions. The difficult problems facing the Nordic region are in no way unique to our territory. On the contrary, nefarious and powerful forces have spread throughout our world like a cancer, with a common goal and approach. The whole world is affected. In order to overcome global Zionism and save our planet in the long run, it is not enough for those of us in the Nordic region to fight this fight alone. This is the reason we have translated this publication into English. Although our organization does not at this time exist outside of the Nordic region, we hope that our party platform will inspire others to advance these sound ideals all across the world. As a European descendant the reader should, regardless of their current home country, sympathize with the content of this publication as it regards their racial survival as well. This fight should feel relevant and be considered to be in his or hers best interests. Although it was the English-speaking world that largely contributed to the eventual downfall of the Third Reich, the Nordic Resistance Movement is well aware that hundreds of thousands of people with their roots outside of the Nordic region have long ago seen through the lies we have been fed regarding Adolf Hitler and his movement. We are also well aware of the power and potential which lies within the English-speaking world. We would do a grievous error if we chose not to spread our ideas to such a multi-faceted and varied readership.